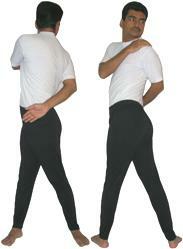 This also a simple yet effective and safe posture which almost any one can practice to mainly exercise the trunk. Its easily controllable circular movement is a good remedy for back pains. Stand with the feet about half a meter apart and the arms by the side. Take a deep breath in while raising the arms to shoulder level. Breathe out and twist the body to the left. Bring the right hand to the left shoulder and wrap the left arm around the back. Bring the left hand around the right side of the waist look over the left shoulder as far as possible. Keep the back of the neck straight. The top of the spine is the fixed point around which the head turns. Hold the breath for two seconds, accentuate the twist and try to gently stretch the abdomen. Repeat on the other side to complete one round. Keep the feet firmly on the ground while twisting. Inhale and return to the starting position, stand straight and relax. This asana is good for back pain because of its easily circular controllable movements. It stretches the trunk muscles. Do not practice if you have a diagnosed disc disease in your lower back. If you are pregnant, then do not strongly contract your abdominal muscles as you twists( open twists) – allow the belly to remain soft; if you have hernia, a detached retina or glaucoma, or if you are menstruating.